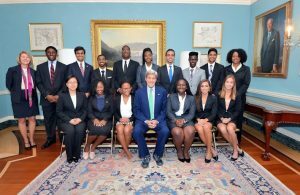 Here is a great fellowship opportunity for students interested in a Foreign Service Career. Entry into the Foreign Service. The program provides up to $47,500 annually towards tuition, room, board, books and mandatory fees for completion of two-year master’s degrees. Members of groups historically underrepresented in the Foreign Service and those with financial need are especially encouraged to apply. Fellows who successfully complete the program and Foreign Service entry requirements will receive appointments as Foreign Service Officers (and have to serve for five years). Be seeking admission to enter graduate school in the fall of 2017 for a two-year program at a U.S. university in an area of relevance to the Foreign Service. Have a cumulative grade point average of 3.2 or higher. Application deadline for 2017 is September 21, 2016. For more information please visit the Rangel website and schedule an appointment with Cindy Schaarschmidt at the Office of Student Fellowships & Awards. This entry was posted in Information for Students, Scholarships and fellowships by kebaird. Bookmark the permalink.